The USCG said Friday that it is coordinating a response with Royal Dutch Shell representatives after the company’s brand new $200 million tugboat experienced multiple engine failures while towing Shell’s arctic semisubmersible drilling rig, the Kulluk, approximately 50 miles south of Kodiak Island Friday, in 20-foot seas. Rough but not unusual conditions for the Arctic. 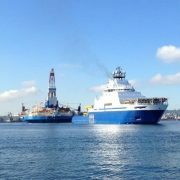 The tugboat M/V Aiviq towing Shell’s Kulluk drill rig in better times. Photo courtesy gCaptain. 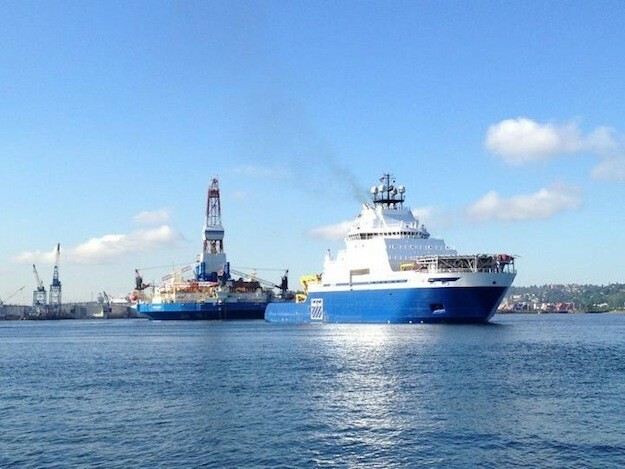 This is right on the heels of the Coast Guard discovering “several major safety and pollution prevention equipment” deficiencies on Shell’s other Arctic rig, the Noble Discoverer drillship. And remember when the Discoverer went rogue and ran aground in Dutch Harbor back in July? And Shell crushed their supposed oil spill containment device “like a beer can” during a field test this summer in water just 120 feet deep? After having multiple delays getting their oil spill response vessel to meet Coast Guard standards? This is a surprising – alarming? – series of missteps, mistakes and outright failures for a company of Shell’s size, talent, market cap and ambitions. Especially considering how much time and money, and political capital, they’ve invested in this program. But it’s not too late to take a prudent time out to allow a thorough, critical evaluation of whether we are really ready to drill safely in the Arctic, and respond effectively to oil spills in that tough environment. Because if Shell isn’t ready after all this time and effort and investment, then who on earth is?